Model 8 of 8 of the series now available for 3DS MAX, Poser / DAZ Studio, Shade 3D, Vue and Bryce. The Lunar Rover is a highly mobile, sturdy transport vehicle for a driver and three passengers (more if they ride outside). The vehicle comes with its own external lighting system, and a trailer for transporting goods; a robotic module manipulator makes it easy to pick up and move modules, loading or unloading the external trailer. Model 7 of 8 of the series now available for 3DS MAX, Poser / DAZ Studio, Shade 3D, Vue and Bryce. Model 6 of 8 of the series now available for 3DS MAX, Poser / DAZ Studio, Shade 3D, Vue and Bryce. Model 4 of 8 of the series now available for 3DS MAX, Poser / DAZ Studio, Shade 3D, Vue and Bryce. 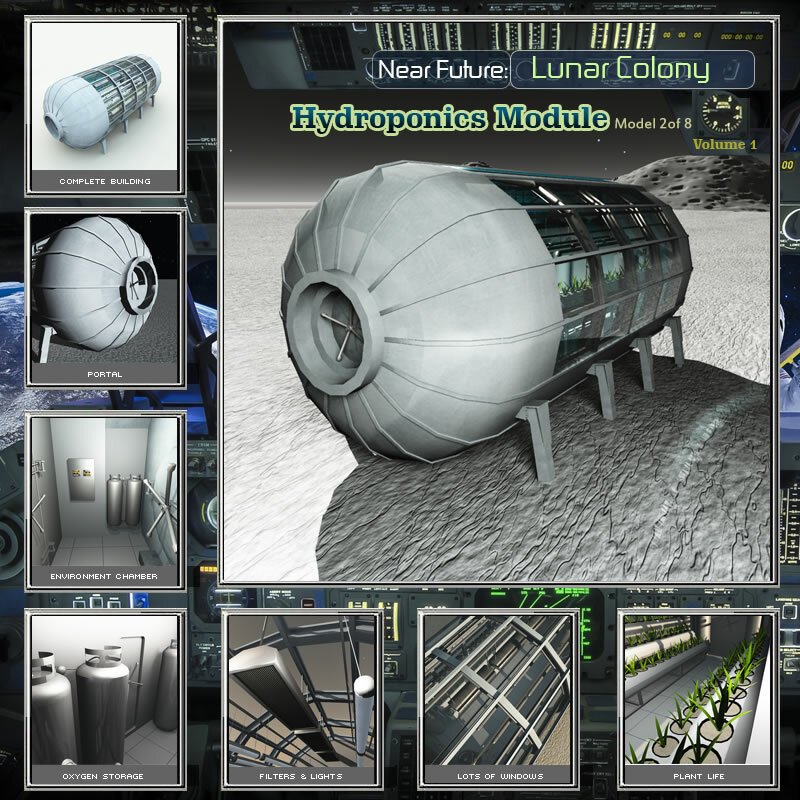 Hydroponics Module (model 2 of 8 of Near Future: Lunar Colony Volume 1) is a self contained system for raising plant life that not only generates oxygen but also edibles. 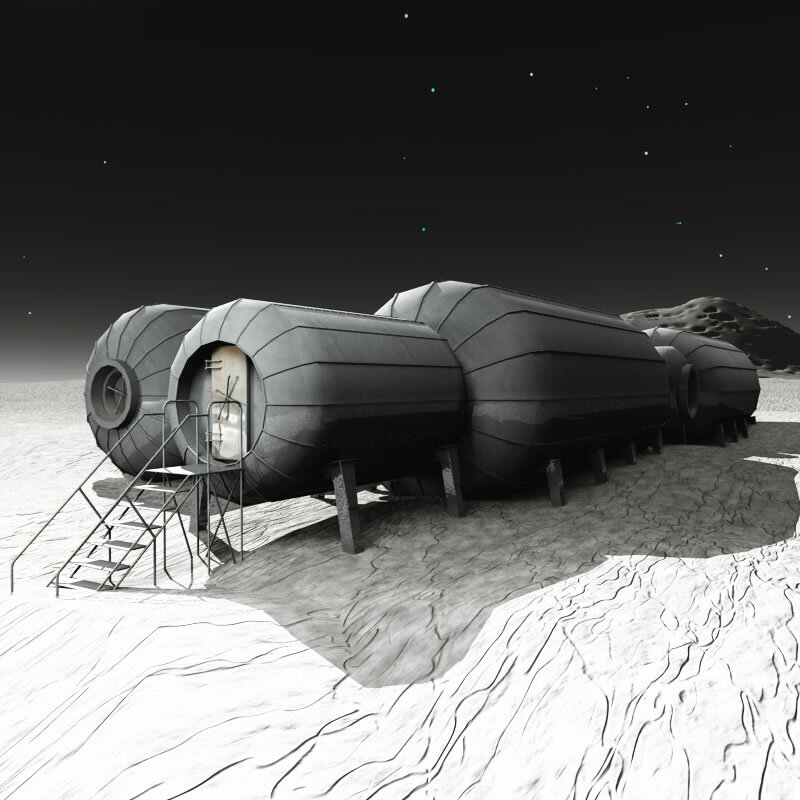 As with other modules, it has an airlock chamber in case it is not attached to an array of modules. The system is complete with lighting and air filters, and several internal tanks to store a back up reserve that isn’t automatically channeled off for use in other modules. You can now get the Hydroponics Module on Content Paradise. Now available for 3DS MAX, Poser / DAZ Studio, Shade 3D, Vue and Bryce.